This is an actual GM Technical Service Bulletin, not a traditional Tech Article. Condensation/water in front park/turn lamps. Water collects on fascia surface and enters lamp through lamp drain hole. Notch fascia as outlined in the following procedure. 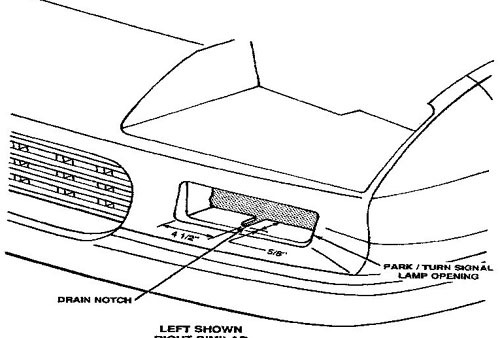 Remove front park/turn lamp as outlined in the Service Manual. Using a small fine tooth hand saw, notch fascia in lamp opening as shown in Figure 1. Repeat for other side if necessary.